Once again I was very pleased to be asked to be one of the judges of the NAMA Youth Awards for 2018. The other judges were Professor Ron Barr, Frances Hampton and Shelley Moffitt of the Department of Education, Sport and Culture and Aimee Corlett from the World Manx Association. There was a good number of entrants across all the categories and it was a pleasure to listen to the selection of music accompanying some of the nominations and the art portraying aspects of Manx life was very varied. 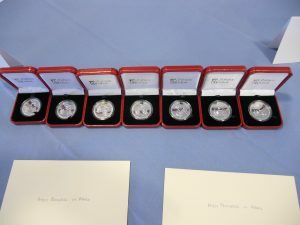 The judges receive details of each nomination in advance and all the entrants lead very busy lives, combining school work with contributing to charity and promoting the culture and life of the Isle of Man. NAMA should be very proud to be supporting these inspiring young people and encouraging their commitment to the Manx community. After some considerable debate winners were decided and the awards will be presented in the Barrool Suite of the Legislative Buildings on Friday 6thJuly by long time supporter and friend of NAMA, Alex Downie, OBE.